When drawing a stick figure from the side for your fashion sketches, start with an 8-head count. 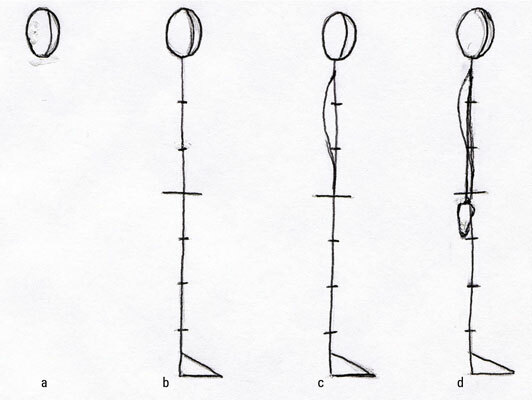 A stick figure drawn from the side looks a bit more relaxed because you show a bit of a curve in the spine by the waist. The head shape is slightly angled, but the proportion lines remain the same. Draw a head shape in a three-quarter view, as in (a) in the figure. The curved line going down the head marks the center of the face.